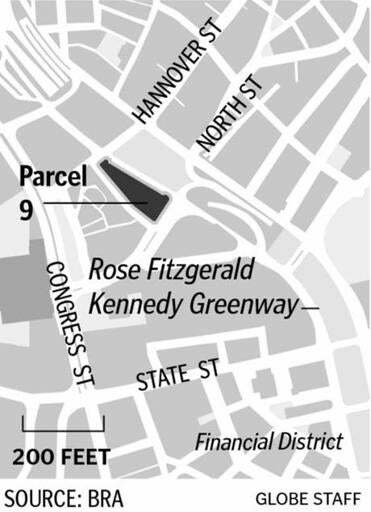 The state is close to selecting a developer to build on one of the last prime parcels along the Rose Fitzgerald Kennedy Greenway in Boston. 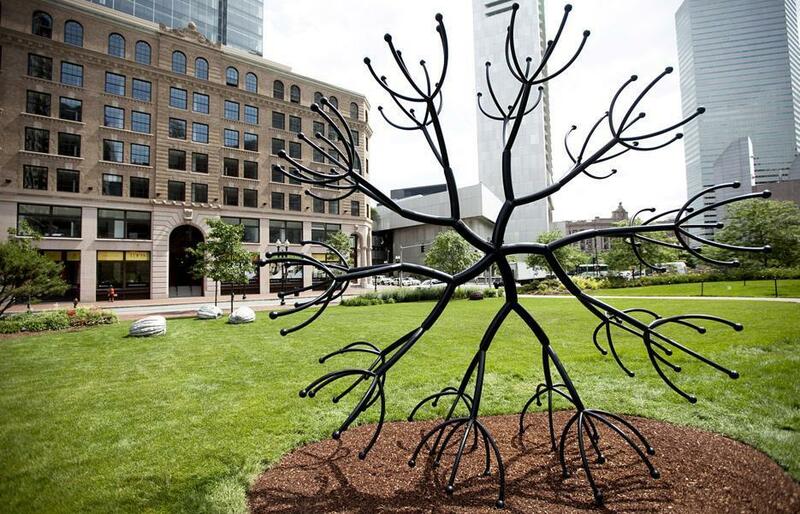 Two finalists were tabbed Wednesday to compete for the rights to Parcel 9, a triangular sliver of land at Blackstone and Hanover streets, near the Haymarket pushcart vendors. Blackstone Market LLC has proposed building apartments above a food market, while Normandy Real Estate Partners LLC would build a hotel with winter gardens. Each team will be asked to submit a final proposal by Nov. 16 to the Massachusetts Department of Transportation, which owns the site. “We’re excited about the plans we received, and we’re asking these developers to submit their best and final offers,” said Cyndi Roy, a Transportation Department spokeswoman. The state will consider the bidders’ rent proposals as well as responses to questions posed by the community, such as how the projects would accommodate the Haymarket vendors, improve Blackstone Street, and handle trash removal and storage. Parcel 9 sits where city and state officials want to create a so-called market district, with local food sellers, farmers, and restaurants. A locally stocked indoor farmer’s market is planned for adjacent property above the Haymarket MBTA Station. The state’s decision Wednesday excluded a proposal for a museum focused on Boston history. But Roy said officials will redouble their efforts to build a museum elsewhere on the Greenway, at a nearby site known as parcel 12, which contains a ramp for the Interstate 93 tunnel. “We’re committed to working with them to get decking built over the ramp,” said Roy, adding that the state wants to find a way to make the project financially feasible. In the past, museum officials have said building over the ramp would be prohibitively expensive. On Parcel 9, Roy said, the state hopes to make a decision quickly following the Nov. 16 deadline. Blackstone Market proposes a seven-story building with a food market, three restaurants on the second floor, and about 50 apartments. The building would also have a 13,000-square-foot rooftop garden that would supply produce to the restaurants. Blackstone Market is a joint venture that includes DeNormandie Cos. and Cresset Development. Cresset developed the five-restaurant Liberty Wharf complex in the Seaport District, which includes Legal Harborside and other eateries. Normandy Real Estate Partners LLC proposes a 180-room hotel with a two-story winter garden. The seven-story complex would include a food market with Haymarket pushcart vendors and other specialty food retailers. The joint venture team includes Jones Lang LaSalle and Normandy Real Estate Partners of New Jersey. Normandy developed the Ames Hotel near Boston City Hall, among other projects.